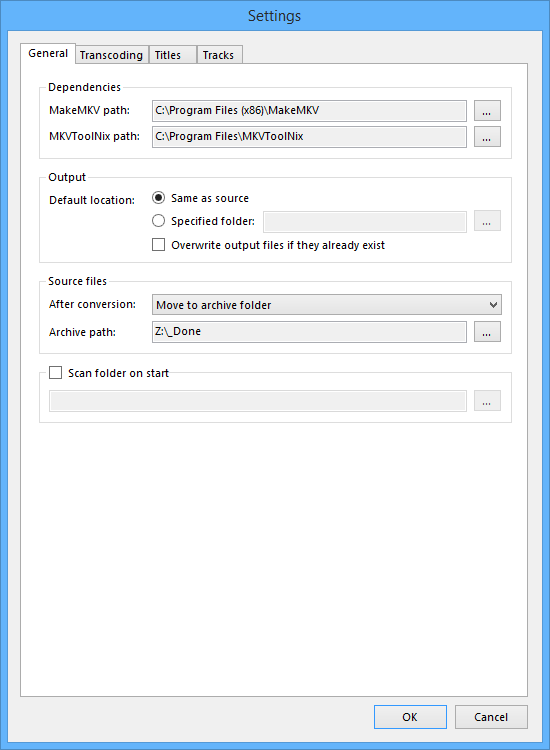 There are already some nice tools for batch conversion of MKV files using the MakeMKV CLI, but I wanted a tool which offered more flexibility with regards to choice of tracks (audio/subtitles) to include, track order and track defaults, and some other features. For that reason, I decided to write my own application to do this: BatchMKV. I put quite a bit of work into it, it works great for my workflow and so I figured I might as well share it in case anyone else finds it useful. In large part the UI is very reminiscent of MakeMKV, with a few nice additions such as an order column showing the effective order of audio and subtitle tracks in the final file and easy selection of the default audio and subtitle tracks. 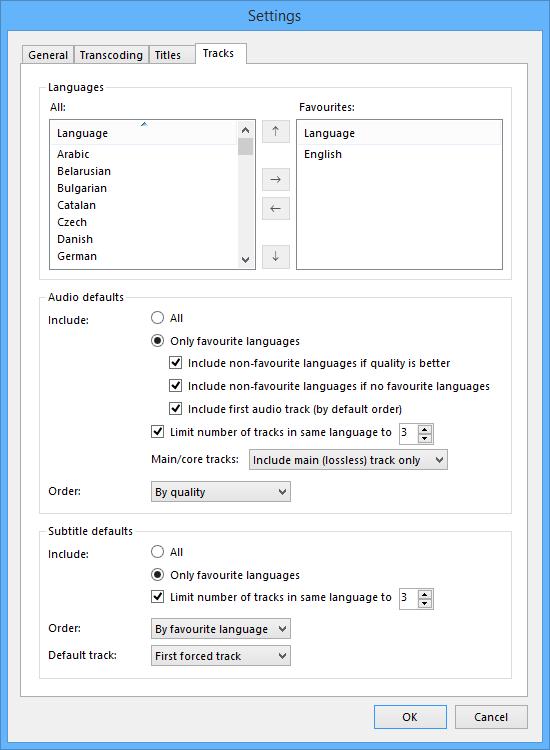 Then there's the batch conversion functionality, as well as a more explicit ability to specify settings without the need to manually create conversion profiles, and advanced default selection and ordering of titles and tracks. Scanning for sources. This is the left-most third of the main window. You can scan both optical drives and folders from the File menu. All sources found will be listed here. Analyzing sources. Once a source has been found, it needs to be analyzed to determine the contents (titles and tracks). This can be done either automatically (File / Analyze Sources) or manually by right-clicking a source and selecting Analyze. If File / Analyze Sources is checked, BatchMKV will automatically analyze all sources. If you select a source in the list that is not yet analyzed, that will prioritized and will be analyzed next by BatchMKV. Converting titles. 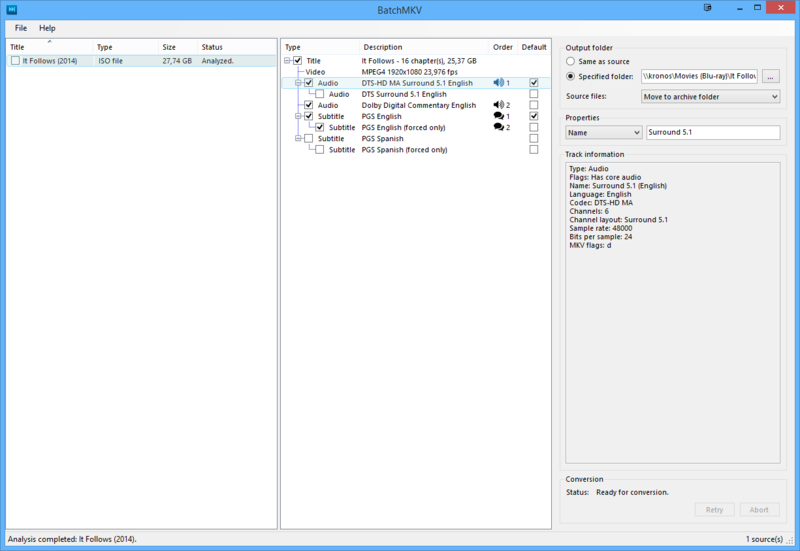 When sources have been analyzed, you can use the right-most two-thirds of the main window to select which titles and tracks to include, and where to put them (Output folder). You can also specify what to do with the source file(s). This part of the UI is very similar to MakeMKV with a few useful additions as mentioned above. Conversion of titles can also be done either automatically (File / Convert Selected Sources) or manually by right-clicking a title and selecting Convert. If File / Convert Selected Sources is checked, BatchMKV will automatically convert titles where both the title and source is checked. The idea is that you first select/unselect titles as desired, select tracks to include, specify output folder, etc., and then once that is done, you check the source item. 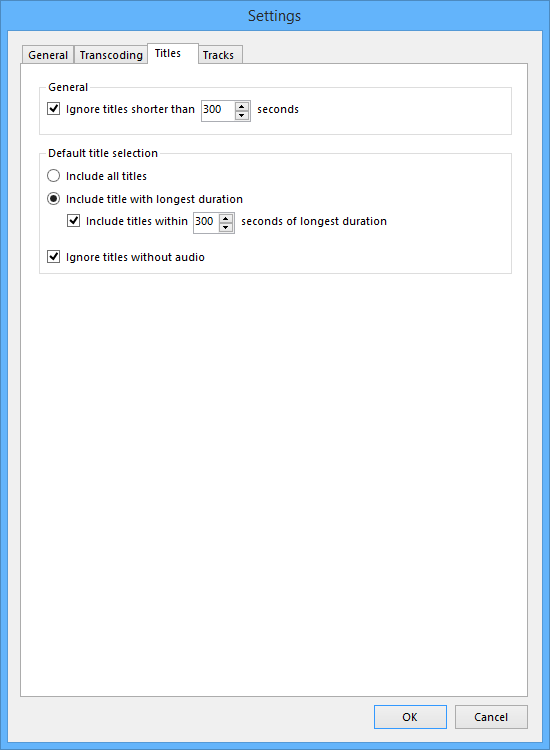 BatchMKV will then automatically convert the titles checked for that source. BatchMKV requires both MakeMKV and MKVToolNix. MKVToolNix is required to modify title/track names and default tracks (this is done automatically by BatchMKV), which is not (AFAIK) possible through the MakeMKV CLI. BatchMKV is available for download here (see changelog). 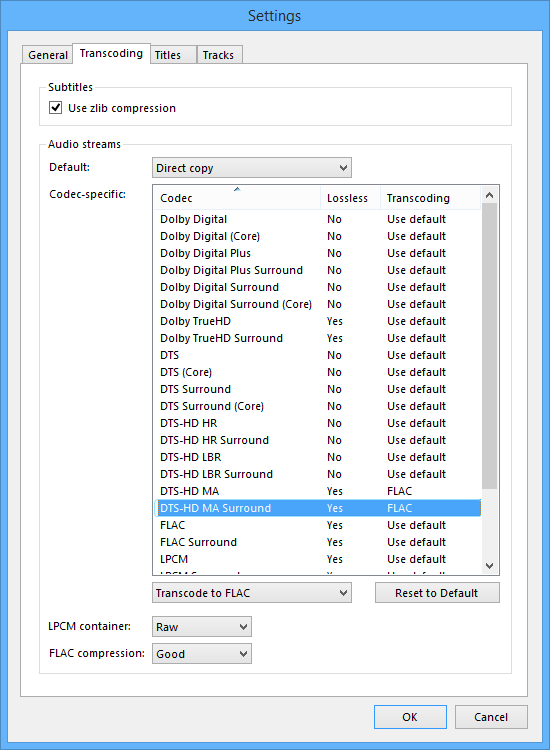 Some lesser known/used audio codecs such as DTS-HD LBR, EAC3 and MLP may not be identified properly. I have not had any files available to test this on. The tool has not been tested with 3D video sources. For sources of type 'Folder', output folder "Same as source" is not available, meaning the output file(s) should be located in another folder than the source. This will be fixed in a later version. Please let me know if you have any questions, find the tool useful, have any suggestions or feature requests or discover any bugs. Last edited by kenneth on Mon Aug 29, 2016 3:57 pm, edited 3 times in total. I discovered a few edge cases where the MakeMKV track selection logic does not work as expected. Temporarily resetting the default selection rule (as set under MakemKV preferences / Advanced) when conversion starts appears to fix this issue. So BatchMKV will now backup your current default selection rule before converting, then reset it to one matching the selected tracks, and when conversion has finished, your default selection rule will be restored. I would still recommend that you make a copy of your selection rule (unless it's just the default of course). I've also changed the behavior so that after conversion, if the tracks in the output file do not match the tracks expected (based on track selection in BatchMKV), it will register as an error ("Tracks in output file not as expected"). Please let me know if you experience such an error. If there's anything I absollutely loath then it's tools that don't allow you to select where to install them. And why would I want to move or delete source files? I want to keep them where they are. Chetwood wrote: If there's anything I absollutely loath then it's tools that don't allow you to select where to install them. It's published using a built-in tool in Visual Studio. It has several advantages: easy for me to publish, easy for users to install, and application updates deployed automatically. If you need to install the application somewhere specific, I guess that's a disadvantage. Chetwood wrote: And why would I want to move or delete source files? I want to keep them where they are. Okay, and there's an option for both you and those (such as myself) who DO need the source files to be either moved or deleted. In my case, I'm converting ripped Blu-ray folders to MKV files on the same drive, so after conversion, the source files need to either be moved to an archive folder or deleted. Hmmm, those would be all the MakeMKVCon switches. "Profile" is undocumented, it works just like all the others though [ Profile=c:\folder\profile.xml ]. Beyond that it's looks like there may be -t, -x and -m switches, unless rtxm is a switch. But then why repeat the letters separately a second time? Would this be with regards to the issue about track inclusion? BatchMKV already uses the -profile switch, but as far as I've been able to investigate, there are still cases where the default selection rule (as set in MakeMKV preferences) seems to affect the results. I was just hoping there were some decent switches left in the "undocumented" category. Unless -t is track selection or something I guess there's not. As far as I can tell MakeMKV.exe uses a named pipe to communicate with MakeMKVCon.exe. I'd been thinking of placing an intercept between the two to try to log whatever goes on there but really can't be bothered and personally have no use for that knowledge anyway. ndjamena wrote: As far as I can tell MakeMKV.exe uses a named pipe to communicate with MakeMKVCon.exe. I'd been thinking of placing an intercept between the two to try to log whatever goes on there but really can't be bothered and personally have no use for that knowledge anyway. Yeah, I figured MakeMKV had to have another method than just the CLI. Unfortunately I have no experience with named pipes or how to intercept them. Maybe some day Thanks. kenneth wrote: Would this be with regards to the issue about track inclusion? BatchMKV already uses the -profile switch, but as far as I've been able to investigate, there are still cases where the default selection rule (as set in MakeMKV preferences) seems to affect the results. Does this happen even if you add an entry for each and every codec encountered and specifically set the selection for each codec type within its entry? Modifying the selection string there should do half the job for you. ndjamena wrote: Does this happen even if you add an entry for each and every codec encountered and specifically set the selection for each codec type within its entry? I actually used to do this, but then I tried removing that (the defaultSelection parameter) and that fixed some cases where no audio was being included at all. I even tried using both defaultSelection="$app_DefaultSelectionString" and defaultSelection="<explicit selection string>", but I still had some scenarios where no audio was being included, with or without modification of the MakeMKV preferences default selection rule. I have not tested if it works without setting the MakeMKV preferences default selection rule, when the defaultSelection parameter of the <output> tag is not set. The latest release of BatchMKV has been tested with quite a few conversions and it has not failed me yet. To be honest, what you're saying sounds like a bug in MakeMKV and you should have reported it. It shouldn't be that hard to specify the default track selection. I can see that people have looked at and downloaded the application. Is it working for you? I'm happy to receive feedback and help with any issues there may be. Hello Man, I have been testing your tool for a little and it seems very good so far. I was wondering since, do you think you can make your app more automatic? I have a collection of more than 600 Blu Rays and what I am trying to do is to set the app so when I put a bluray in my drive it does automatically rip the movie to a folder I set that is where KODI will scan to add the movies (in my case is a Nas Drive). I know it will be never be perfect considering that it may detect the wrong video or movie or something, but I think in general it will do a good a work. AlbertX wrote: Hello Man, I have been testing your tool for a little and it seems very good so far. This should be possible. It would just auto-rip the default title selections with default tracks. I will have a look at it. Thanks a Lot man, been testing it more and so far your software is working great. I think you will make a hell of a software if you added that possibility into your software, it rips the Blu Ray and the compressed or transcode I don't know the right word. Thanks man really apreciate your effort.